Dr. Roopa Jayaprakash has done her MBBS from Calicut Medical College, India. She worked as ESI Medical Officer for two years in India. 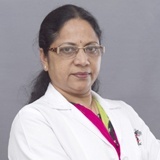 Dr. Roopa is experienced in Emergency medicine, treating chronic cases like diabetes, hypertension, bronchial asthma, minor surgical procedures, suturing of wounds, incision of wounds, incision and drainage of abscess, ward management and burns cases etc.